To anyone who argues that Politicians are all the same I give you Charles Kennedy. Despite having spent his entire adult life in politics, Kennedy was someone who was most definitely his own person, refusing to conform to the prevailing political conventions, and, sad to say someone who suffered from a debilitating illness that first took away the job he loved and now, at 55, has taken away his life. To anyone who argues that politicians aren’t like us, that they aren’t human, I give you Charles Kennedy. Kennedy entered the House of Commons at the age of 23. It came as a bit of surprise to many, including Kennedy, who was settling into a life of academia at Indiana University, to where he had won a scholarship. Kennedy was standing for the constituency of Ross, Cromarty and Skye against a Tory government minister, Hamish Gray, and had flown back to the USA before polling day so little hope did he think he had. However, win he did. It was the same 1983 General election that Tony Blair and Gordon Brown entered Parliament, but they entered under different circumstances. Kennedy’s party, the newly formed Social Democrat Party – had formed an Alliance with the Liberals that at one point was looking like it was heading for government but actually ended up with only 22 seats despite winning 25.4% of the vote (yes, FPTP fans, that is 3% of the seats with 25.4% of the vote). Kennedy rose up the party, holding a series of front bench posts throughout the 1980s and 1990s as the SDP/Liberal alliance became official when they merged in 1988 as the Liberal Democrats. He did this whilst appearing on TV so much he was nicknamed “Chat show Charlie” – a sobriquet he hated but one which at least gave him sufficient profile and name recognition. Thus in 1999 when Paddy Ashdown stepped down as party leader, Kennedy emerged as clear favourite with the press to win the leadership, and did so with relative ease. What followed was a period that many might look back in future as the high water mark of Liberal Democrat influence on British Politics. In 2001 the party became the most successful third party in terms of seats at an election since 1923 and in 2005 they won 62 seats, their record, and one that might never be beaten. That 2005 election was again an example of the problems with our election system. The Lib Dems had been the only major party that had voted against the Iraq War, seen as Kennedy’s finest political hour. They had also successfully decoupled themselves from their ties with Labour, promoting different policies on tax, the environment and Europe. Yet with 22% of the vote they had only won 9% of the seats and voters had said in polling that they would have been more likely to vote for the Lib Dems if the election system had given them a chance of winning. That 2005 election was the beginning of the end for Kennedy as party leader. Having been a familiar sight in the bars and pubs of Westminster there had always been comments and questions about his drinking but he had denied there was a problem. During the election campaign he appeared at some press conferences and struggled to answer questions on policy – which was officially explained as lack of sleep as he had a young baby. But people were putting two and two together, seeing a perspiring performance at the 2004 Lib Dem conference, a non-appearance with 15 minutes notice to give a 2004 budget speech and now these election performances and the rumours started to grow about his drinking. A few months after the election, some journalists cornered him with evidence he was receiving treatment for alcohol addiction. Kennedy admitted it, then called a leadership election, which he at first said he would stand in, but then was persuaded to pull out of. At 45, he was no longer leader. Kennedy continued to have a relatively high profile, often speaking publicly about political issues. After the election in 2010, however, his obvious disappointment at the joining of the Lib Dems with the Conservatives in government was hard for him to hide, given his commitment to the Lib Dems being part of a realignment of politics to the centre-left. Marginalised by this opposition, he ended up a relatively quiet back-bencher. His marriage to Sarah ended in 2010, and he moved into a small cottage in his Scottish highlands constituency. Sadly, the last major public appearance Kennedy gave was as a panelist on Question Time in March this year. He had been approached directly by the BBC and not put forward by the Lib Dems. He appeared to struggle to follow the arguments of the other guests, gave confused and disjointed answers, misinterpreted comments from fellow panelists and wagged his finger constantly. The BBC was attacked afterwards for letting him go on and not showing a duty of care towards him. On May 7th, Kennedy lost his seat, after 32 years in Parliament, a victim of the SNP phenomenon sweeping across Scotland and the Lib Dems’ meltdown sweeping across the UK. There haven’t been full details released around his death, but at 55 it is to be assumed that it might be related to his alcoholism, with some suggestion that he may have taken his life (I will update this paragraph as details appear). I suspect that the loss of his seat was the last straw for someone who has lived and breathed politics for over half his life. We forget just how human these politicians are. When you lose your seat, you lose your job. You lose your livelihood at a second’s notice. When you have been President of your political party and then its leader one day, then not even a Member of Parliament the next, it can be particularly tough. This, I feel, was particularly true for Charles Kennedy, whose raison d’etre was politics. Behind the masks that politicians wear are fundamentally decent human beings. They may have flaws, but they are just like you and me. 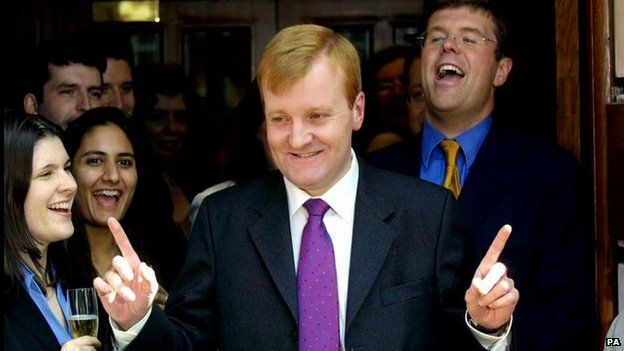 Charles Kennedy was a fundamentally decent human being, and we will all miss him.